Do you follow any "fashion rules"? Did you even know that there used to be (and still are to some) "fashion rules"...."do's and don'ts" if you will. Some rules have been forgotten, some are just ignored, and some are entirely practical (in my opinion). I will admit that I DO follow some fashion rules. I pack away my winter clothes every spring and bring out my summer clothes. One thing that I look forward to is my summer purse. 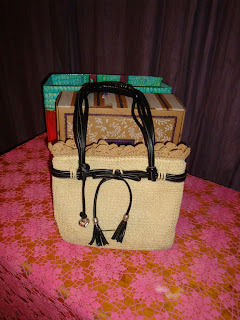 It's "straw" so, it is only a summer purse. 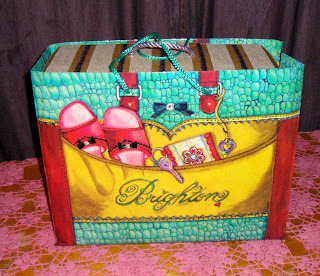 I splurged on a Brighton purse. This year is my THIRD year with this purse. So, if I break it down by the year...it's becoming a very affordable purse after all!! Brighton sure knows how to package....don't they? 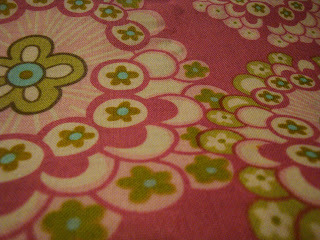 I love the bright pretty bags. And, it came with a great box to store it. 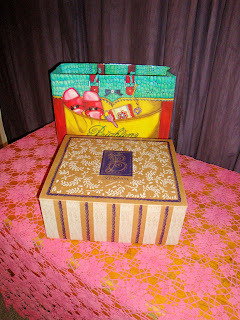 Inside the box is a bag. That really makes it more of a "treasure". 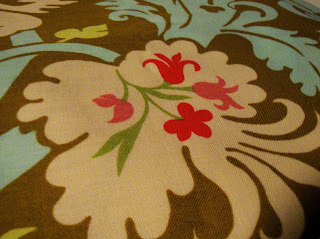 A pretty lining and LOTS of pockets for all my stuff. Here are some more "fashion rules" that I follow. Easter starts the summer season. No matter what the weather....I will not wear winter only things (like boots) after Easter. Labor Day starts the winter season. I actually change out my closet each season. It's a great time to re-assess my wardrobe. I purge those things I didn't actually wear. I also make a list of things I need for the new season. I have a sort of 'all season' part of my wardrobe that stays in year round. And, each changeover, I keep one or two outfits for those days when the weather is un-seasonal. Last fall, I took this even further. I took a picture of myself in all of my clothes, so I could really see what everything looked like. I just set up my tripod and snapped away! Wow. It was a real eye opener. Some of my favorites really didn't flatter me at all!! Some things that I NEVER wear, looked pretty good. I'm going to do it again with my summer clothes. It helped me let go of a lot of clothes that I don't need or want. And, it made getting dressed every day so much easier. My closet had room to breathe and I knew that EVERY item in my closet was a true favorite. What about you? Do you have any "fashion rules" that you follow? Leave a comment and tell me more "rules" to put on my list! Do you think that different parts of the country see the rules differently? I have always thought that California (where I live), is a lot more relaxed about fashion rules. Do you agree? I would love to hear about the do's and don'ts in your part of the country!! This may sound overwhelming to some of you. For me, it's important and fun. You see, I have ALWAYS loved clothes and fashion. In fact, in the 80's and 90's I was an Image Consultant. I used to show people which colors looked the best on them, and which clothing flattered their figure. Then there is the clothing "personality" style. You can really tell a lot about a person from their wardrobe. What does your wardrobe tell people? I've been waaaaay to busy to pull out my summer clothes, and Easter has come and gone. This weekend is it. It's time. 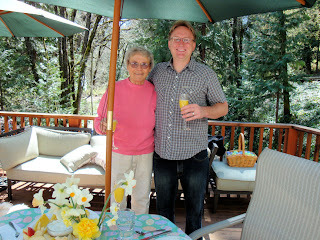 I think that 80 is a milestone as far as birthdays go, so I wanted to have a party for my Mother in Law this year. I started talking about it a year ago. The plan was to have a potluck in the yard....set up some tables and chairs etc. It turned out to be so much more than I imagined, it was a lovely day. I didn't have enough tables and chairs, so we rented these. Don't they look so nice? We woke up to rain (and cold) the day of the party. Wow. That made me nervous. But, later in the day, the sun came out and all was well. It was a little chilly, thankfully we had a heater. And, a friend loaned us two more. Dear Daughter was the "bartender". She was so good. She and her hubby were great help! Also, my husband's brother was here visiting for the occasion. So, BOTH of Joyce's kids were here. My brother in law was amazing!!! He helped so much, I don't think we could have pulled it off without him!! This was my BIG surprise. I was hoping to find someone to come over and play the violin for my MIL. I called and called and found this terrific group of ladies who play together. They came and played (WONDERFULLY!) for the party. They didn't know us and they just came out of the goodness of their hearts! Can you believe that? My Mother In Law was super delighted! She is a serious lover of classical music. Here is the birthday girl (in red), reminiscing with friends as they look through some photos. Doesn't she look like she is having fun? This is Chesney of Blue Moon Cafe and Catering in Pine Grove. Oh my goodness!! The food was delicious! Everyone was commenting on it. She did a fabulous job and the presentation was beautiful! If you live in the area, I HIGHLY recommend her for catering....and her restaurant is pretty terrific too!! These are two friends of mine, Lynn and Lynn...I'm in the middle. Lynn on the left made the awesome cake. She is a danger to my waistline!!! My hubby sketched out a drawing of his Mom's airplane and Lynn put it on the cake. I don't know how she did that!! 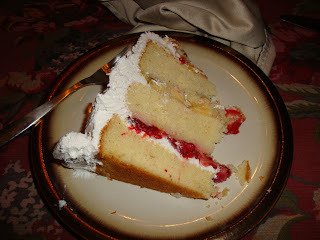 And, did I mention how yummy the cake was? MMMMmmmm, MMMmmm, so pretty and delicious too! I love how the frosting is the sky and clouds. Very unique!! It was a great day. I'm pretty sure that my Mother in Law had a great day. This lovely lady in pink, is my Mother In Law, Joyce. She turns 80 today!! We just heard a plane overhead, and we ran out to see if it was her. YES, she has a plane and she flys it!! Joyce is a retired school teacher. She is also an artist, sculpture and bronze mostly. She knows how to weld and she loves to work outside. Her energy is boundless. She is an inspiration to me. I have lived next door to her for 21 years now. 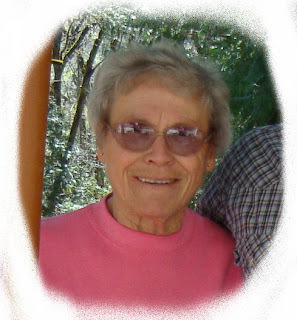 She has been a wonderful Mother in Law and a terrific Grandma. For now. Grab that cuppa and take the Pink Tour! Visit Beverly's for all the scoop. These are so lovely....don't you think? Can you smell that? I got these lovely lilacs from a new friend. We are having a party tomorrow for my Mother-in-laws 80th birthday. She has many friends that I have never met and I'm looking forward to meeting them all. One such friend lives right here in the neighborhood. I have heard them mentioned many many times, but for some reason, I have never met them. When she called and offered these lilacs to me, I jumped at the chance. My MIL and I went over for a visit. I just loved them! They are Swiss and though they have both lived here for many many years, they still have strong accents. I got to tour their wonderful gardens and hear great stories. I am excited to go back for more!! If you are wondering....yes, I am still cleaning! It's been a TRUE "spring cleaning" and I am loving the results. Wow. It feels like my whole house is "lifted", know what I mean? The big party is tomorrow and I can hardly wait!! I have a couple of HUGE surprises. I'll let you know how they turn out. Take a moment to stop and smell the "roses" today. Or the Lilacs. Or ....any flower will do!! It's Saturday...so it must be PINK!! If you haven't visited Pink Saturday before, you are in for a treat. Visit Beverly for the details!! What am I dreading?? Today I have to do housecleaning. Yep. HAVE to. We are having a party on Friday for my Mother In Law's 80th birthday. And, it's at my house. That means I have to get it all spiffed up. And, I truly, deeply do NOT like to clean. Really. Just hate it. 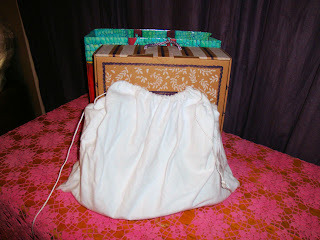 However, I want to create a good impression for the guests, so I will do it. Ugh. 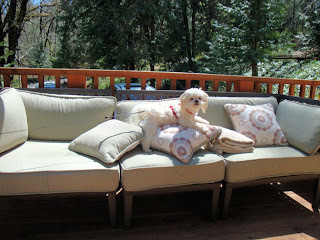 I also have to get the garden ready, as the party is outside (hoping for good weather, and it looks good so far, whew!). This is another thing on my agenda for today. Make pillows. It's not a MUST like the cleaning, it's a WANT. I have been searching for something "spring-y" for brightening up my living room, and I just haven't found anything I like. So, I decided to cover the pillows I have. 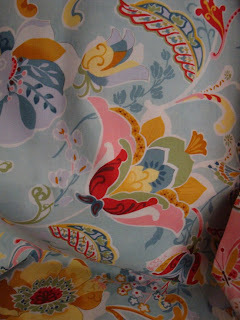 I found this lovely fabric at Roseanne's (The General Store). 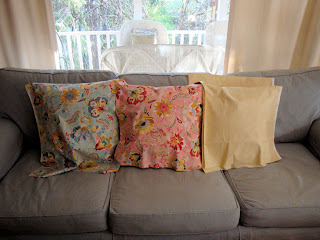 I don't do a lot of home decor sewing. Please wish me luck. 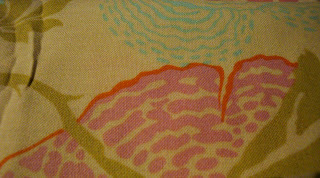 It's going to be 2 blue pillows and 1 Pink with the cream color in the back. 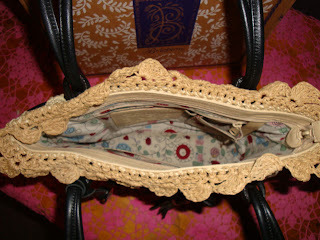 I have set my sights high with plans for a zipper and piping. Is that asking too much? With all this "Have To" planned for today....don't be suprised if I end up visiting even more Pink Saturdays than usual. I am an expert at procrastination and avoidance. Are you looking for a fun way to fill your Saturday? Get with the Pink! 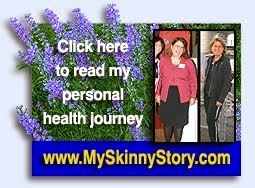 Check out the rest of the Pink Saturday blogs! It was like a 'coming out of hibernation' party!! The weather had been raining ALL week. 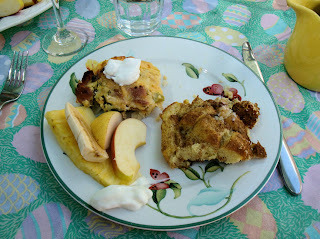 Then the sun came out for Easter Sunday and we took advantage of it by having our family brunch out on the deck. Here is my Mother in Law and my Son in Law, waiting for the feast to begin. It was SO sunny, we had to put up the umbrella! 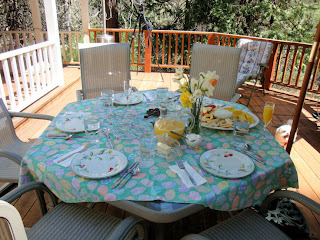 Yes, I know the table cloth didn't fit....BUT it DID have Easter eggs all over it. 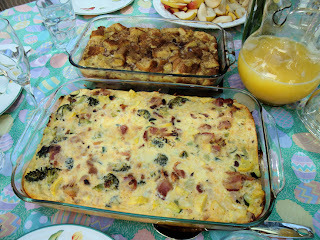 This was the bacon, egg, broccoli and hash brown casserole. MMmmm it was so yummy. And really easy. I put the hash browns in first and baked them for about 15 minutes, then I just layered eggs (with some milk), bacon, broccoli & squash (lightly steamed first) and some cheese. I did sprinkle a little bit of Spike (my favorite 'season all'). Bake with foil for 45 minutes and without for 30. For someone who doesn't cook (me), I thought it turned out good. 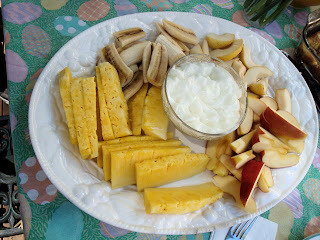 I love fresh fruit with yogurt to dip. This was a huge hit. 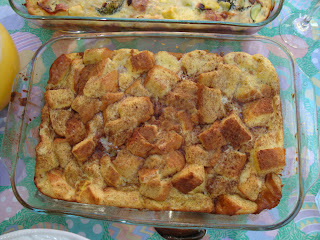 French Toast casserole. Wow, it was so easy! First I buttered the pan, then I put in about 6 pieces of French Toast bread. In a bowl I blended about 8 eggs, some milk, a teaspoon of sugar, and I poured it over the bread. Let that sit for about 10 min., then stir it up a little, sprinkle with lots of cinnomin and bake for about 45 minutes until golden brown. I wish I would have had some raisins to add....wouldn't that be yummy?? Mmmm. This makes me hungry just looking at it!! Pookie was enjoying the festivities and the sunshine. 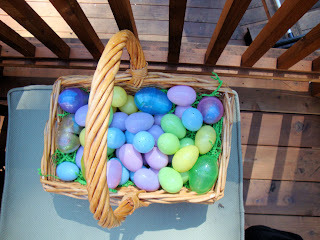 I made up eggs filled with candy as a suprise for my daughter (and everyone else of course!). She surprised me by bringing the SAME thing!! 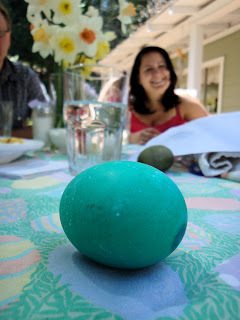 AND, the Newlyweds even dyed eggs. How sweet. Their first Easter as a married couple! 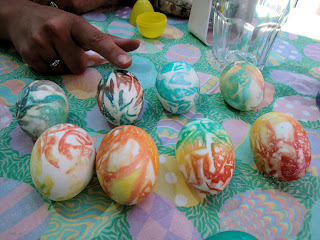 Their eggs were all done in Tie Die, my daughter's favorite. They turned out so pretty. We even had an Easter Egg Hunt. Yep. With ALL grownups. Well kids at heart. It was a blast. We hid those eggs in some impossible places! It was even hard to remember where we hid them! This egg was just for me. 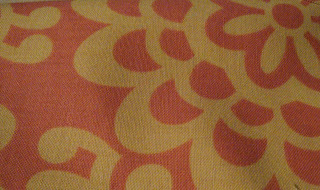 Dear Daughter made it in my favorite color. Now. Keep that warm weather coming so we can all enjoy being outside. Hello Pinkies!! It's a very Easter-y Pink Saturday. Let's have a little mystery...shall we? Can you guess what this is? Isn't it pretty? It's something I have wanted for a while. I usually wouldn't buy it without touching it and feeling it first. My friend, Lori has some of this and I knew I wanted some for my own! 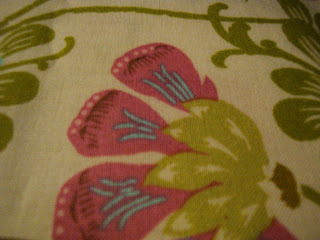 I'm going to make something with it....but what? Actually, I don't really know the answer to that question myself! You already guessed, didn't you??? 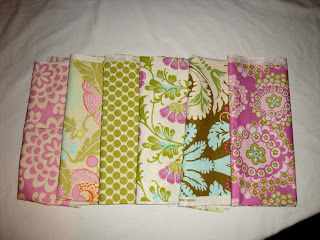 Not just any fabric, it's a collection of Amy Butler fabrics. I'm thinking that they would make some fabulous pillows....hmmmm?? 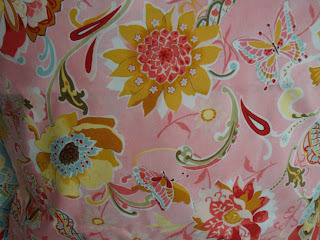 I hope that you are having a wonderful Saturday....For more Pink, please visit Beverly's and take the Pink Tour! Mmmm. 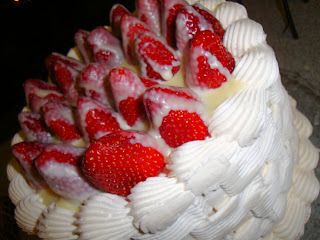 Isn't this cake a work of art? It's beautiful! I was lucky enough to be invited to a friend's birthday party this week, and this was the birthday cake. Does it make your mouth water? Just looking at it right now makes me want another piece! The frosting is buttercream (my favorite). 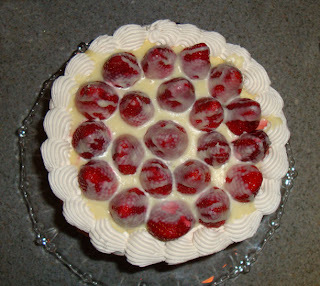 Fresh strawberries (soooo sweet) and on top..... drizzled white chocolate. Oh yes!! The birthday girl baked it herself. It was HER birthday, but WE were the ones who got the treat!! 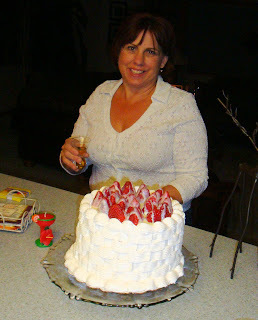 Lynn....Hope you had a wonderful Birthday!! 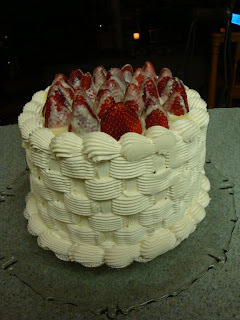 Inside was a layer of bananas and cream, and strawberries! 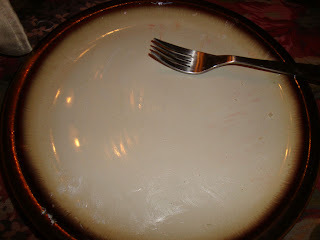 It only looks like I licked my plate. I wanted to, but then I might not get invited back, right? I even got to take a piece home. That didn't last long, let me tell you! !